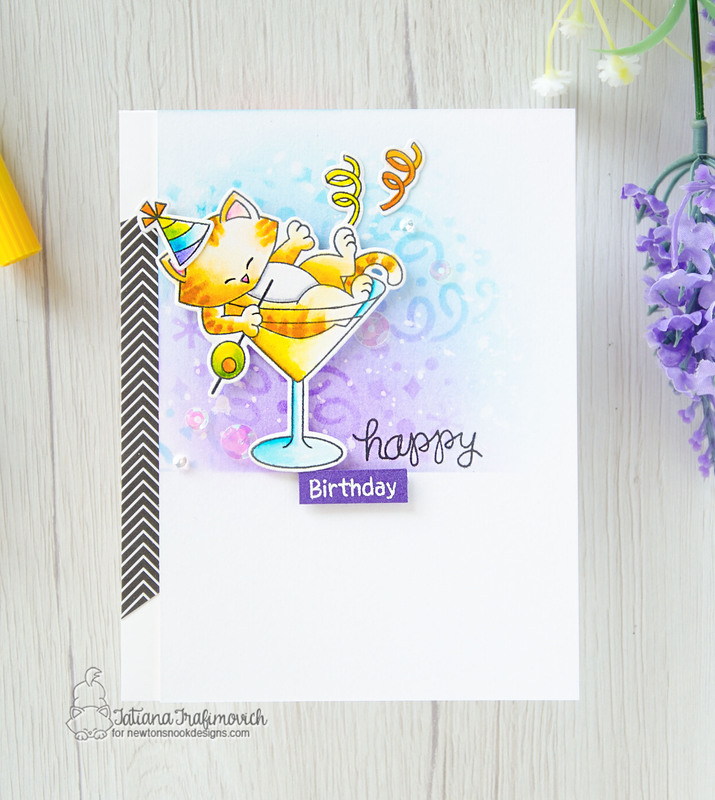 I’m so happy you’ve joined me today and even more excited to be on the Newton’s Nook Designs blog sharing a sweet birthday card with the adorable mischievous kitty! It was quite some time I haven’t done a kitty card and so it was time so choose one of the NND cat’s set! 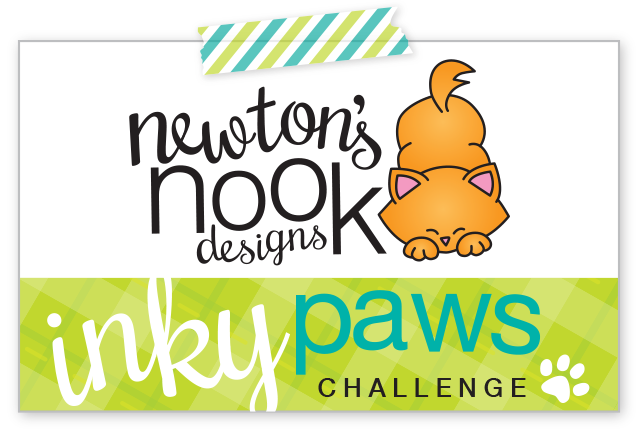 The choice was tough because NND has tons of adorable images, but finally I decided to play more with Newton Celebrates stamp set! It’s super versatile and can cover lots of occasions! 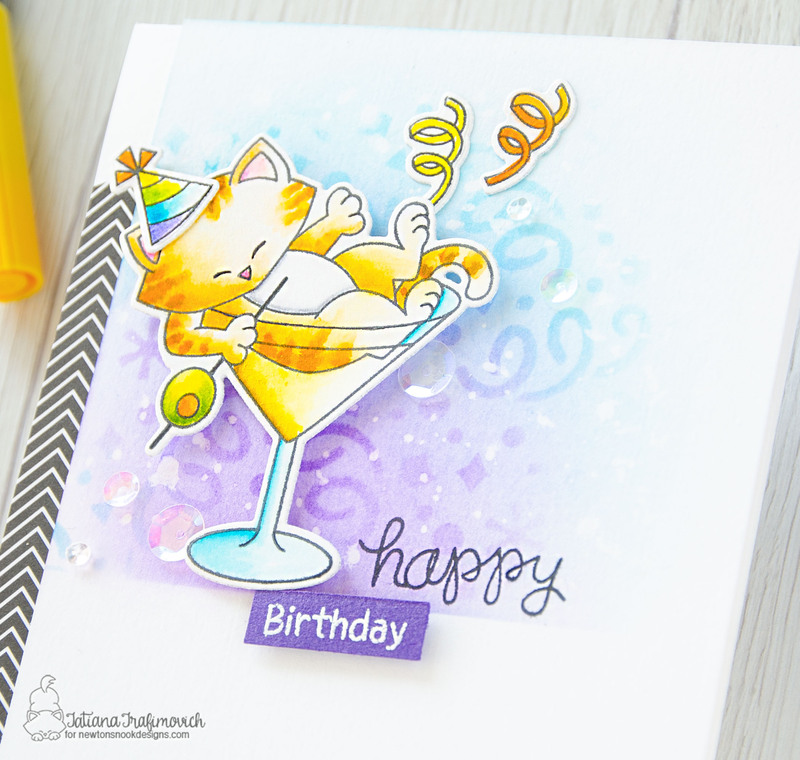 To start I die cut the cute kitty in the Martini glass from Strathmore Bristol paper using the coordinating Newton Celebrates Die Set. Next I stamped the outline image and colored it with watercolor markers. In case we’re wondering, here’re all the exact TOMBOW markers I used on this card: n.N75, n.025, n.026, n.055, n.090, n.126, n.133, n.443, n.491, n.623, n.703, n.800, n.991, n.933. When I work with cute stamps, I like to keep them in focus and make simple backgrounds. And so I masked the bottom part of the card front with a piece of a sticky tape and inked on top Tumbled Glass, Mermaid Lagoon and Wilted Violet Distress inks. Then I placed on top Confetti stencil and inked again using the same inks to create a tone on tone pattern. A few water droplets added a fun look to the background and finally I could assemble everything and add a birthday sentiment from the same Newton Celebrates stamp set. 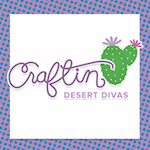 Hope you like this cute project and will get inspired! As always thanks so much for stopping by! This is a fun card. I love the cute stamp. It would definitely be versatile. Great coloring, too.